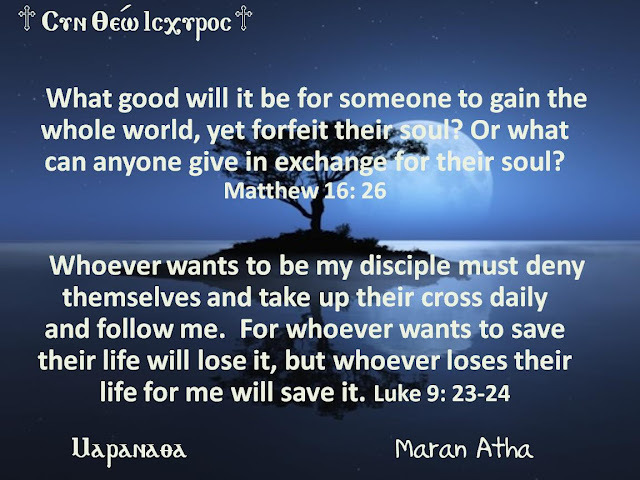 Whoever wants to be my disciple must deny themselves and take up their cross daily and follow me. For whoever wants to save their life will lose it, but whoever loses their life for me will save it. It's better to think of our Eternal Life than to think of our daily life interests. Successful in life should not lead us to lose our spiritual life. There are many ways to lose one's soul, but there is only one way to win it. By engaging activities, needs and life interests we do not find time to think about our eternal. But our lives was not given to us to fill it with many activities. No! But means we should benefit our time on earth to know God well and serve Him. We should not forget that our Eternal life depends on spiritual values.